To paraphrase the old saw, everyone talks about evolution but no one does anything about it. 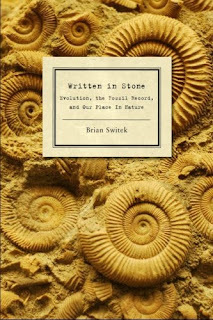 Well, Brian Switek decided to do something, at least he decided to write a book about evolution. Written in Stone: Evolution, the Fossil Record, and Our Place in Nature clearly shows how evolution has operated on Earth for billions of years. In doing so, Switek hammers one more nail in the Creationist coffin and provides a thoughtful account for any who want to learn more about evolution, fossils, and the cultural history of evolution. Switek, who blogs for Wired magazine at Laelaps and the Smithsonian’s Dinosaur Tracking, takes a two-fold approach. Primarily, he focuses on the fossils and what they tell us but he also weaves in the people who have studied those fossils. This approach allows him to give readers connective tissues to the science. After all, it is far easier to understand the science when you are also following the fascinating personalities connected to the research. What makes his book valuable is that he not only weaves in history, providing descriptions of sometimes overlooked characters and their contributions, as well as the main players, but he also brings the science into the present with up-to-date accounts of some of the biggest discoveries of recent years. You come away with a better understanding of how science and scientists work and how science is not a black-and-white field but multi-hued with many interpretations. Furthermore, he shows how scientists do not operate in a void and do respond to the culture around them. Switek is clearly enthusiastic and passionate about evolution and the fossil record. He has thought long and hard about how to tell his stories and how each helps us see another facet of evolution. At times he is a bit dense with scientific names and details (I think this is due in part to his excitement for the subject; he is bursting with information and can’t help wanting to share it) but for the most part Switek keeps his stories moving along, constantly showing us the beauty of evolution and how scientists made and continue to make stunning discoveries that flesh out the many stories of life on Earth. Brian was kind enough to answer a few questions I posed to him. They give a good impression of his writing style and his deep passion for the wonders of science. 1. You cover many intriguing people as you delve into the history of paleontology. If you could meet any of the historical people you write about, who would it be? Thomas Henry Huxley. Everyone knows him as “Darwin’s Bulldog,” but as I dug into his work I was impressed by the quality of his writing and how he was one of the first to popularize evolutionary transitions in the fossil record (most notably the origin of birds from dinosaur-like creatures, whales from terrestrial ancestors, and horses from small mammals). 2. What would you ask them? I would love to know more about his quibbles with natural selection; why did he prefer large-scale leaps and why did he propose that many evolutionary transitions took place during non-geologic time? And what made him eventually shift his interests from paleontology to lab-based anatomical studies later in this career? Rather than just pelt him with questions, though, I think it would be fun to update Huxley on what we have learned since his day. I think he would be enthusiastic about the discovery of feathered dinosaurs, especially since he tried to imagine what such a creature would look like over a century before the first ones (excluding Archaeopteryx) were found! 3. If you could see in time lapse photography any of the evolutionary events you discuss, which one would it be? The evolution of the first birds from feathered dinosaurs. Definitely. We have learned so much about the origins of birds in the past 10 years alone, yet there is still much we don’t know. To put it another way, it is fantastic that we have been able to identify so many avian characteristics in dinosaurs, but those traits are so old and widespread that pinpointing the origin of the first birds is still relatively problematic (even if we know feathered, raptor-like dinosaurs were their ancestors). Plus, on purely aesthetic grounds, I think a photo time-lapse of the origin of birds would be absolutely beautiful given the colorful plumage the animals in question probably had. 4. If you could have been there to find the first fossils of the animals you discuss, which one would you have wanted to discover? 5. 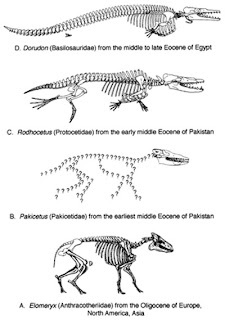 What do you think that modern paleontologists can learn from their predecessors? Always be mindful of what is still unknown. One of the things which became clear as I documented what we have learned about each of the transitions I discussed was how many times evolutionary trees have been redrawn and major transitions have been reinterpreted. The paradox of the fossil record is that it is amazing rich but frustratingly incomplete. Even though we are tempted to fit everything into these neat little conceptual boxes there is still much left to be discovered. This doesn’t mean that we’re going to have trash everything we think we know now – I think we have a more comprehensive view of the fossil record than ever before – but we should take care when we start saying “X species was ancestral to Y species, and that shows that the transition happened like this.” That’s fine as presented as a hypothesis, but what if species Z turns out to fit in that gap and species Y represents part of a diversification which left no descendants? That sort of thing has happened before, and in talking about paleontology to the public I think we should always distinguish between the facts of the fossil record and what we are inferring from them. 6. What is the central point about science that you learned from your research and writing? That the history of life on earth has been stranger and more wonderful than anyone could have imagined. Who could have imagined something like Pakicetus or even something as familiar as an Apatosaurus had they not heard of them first? And things just keep getting weirder. Having just returned from the annual Society of Vertebrate Paleontology meeting in Pittsburgh, PA, I can tell you that the more we dig into the fossil record, the stranger prehistoric life becomes. Evolution is not some mundane, straightforward march of lowly little creatures to impressive beasts. It is a wildly branching process which has been cut back by extinction multiple times and has led to the origin of innumerable creatures which have no living counterpart. I appreciated this on a superficial level when I started by research, but the deeper I dug into the science the more I was left in awe of the fossil record. 7. What surprised you most in your research? How much quirks of history played into the development of scientific thought. The distant reach of European empires, for example, allowed naturalists to travel to far-off places which otherwise would have been inaccessible, and racist notions about the origins of humans prevented anthropologists from investigating the strata of Africa for human ancestors. Imagine what our understanding of evolution would be like today if scientists had stumbled upon the rich beds of feathered dinosaurs from China much earlier; nearly a century’s-worth of debate about bird origins might have been tossed out. Just as the history of life is marked by contingency, so is the history of science. 8. And finally, what did you leave out that you wished you could have put in the book? I had originally written a short summary of primate evolution for the human evolution chapter, but that part of the book was overlong already and I had to lose it. It was painful to do – especially since human evolution is almost never placed into the wider context of primate evolution – but given space constraints I didn’t have much of a choice. I was able to partially make up for it by talking about Darwinius and other early primates in the introduction, but I still wish that I could have gone into a little more depth about early anthropoids, Miocene apes, and other fossil primates.